Condamine is a town and a locality in the Western Downs Region, Queensland, Australia. At the 2016 census, Condamine had a population of 384. Condamine is claimed to be the location of the invention of the 'Condamine Bell', a small bell made from sheet metal used to locate herds of cattle. 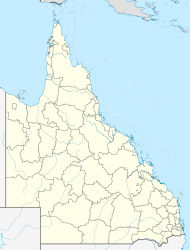 The town is 333 kilometres (207 mi) north west of the state capital Brisbane and 34 kilometres (21 mi) south from the town of Miles, in the Western Downs Region local government area. It is located in the centre of the locality. The Leichhardt Highway traverses the locality from north to south passing through the town. The Condamine River passes to the west of the town. Tieryboo Post Office opened on 21 May 1856. It was renamed Condamine in July of that year. Condamine State School opened in 1863. On 30 December 2010, flooding forced evacuation of the town, with the level of the river expected to exceed 15 metres (49 ft). The town was evacuated twice in 10 days during January 2011 as the rains continued and caused flash floods. The first flood peaked at 13.2 metres (43 ft). Condamine is serviced by a small hotel and a roadhouse. The roadhouse is an old style classic truckies' roadhouse. Condamine State School is a government co-educational primary school (P-6) at 5 Kennedy Street. The school opened on 1 January 1863. In 2016, the school had an enrolment of 32 students with 5 teachers (3 equivalent full-time) and 4 non-teaching staff (2 equivalent full-time). It is one of the oldest state primary schools in Queensland. ^ a b c Australian Bureau of Statistics (27 June 2017). "Condamine (Murilla Shire) (State Suburb)". 2016 Census QuickStats. Retrieved 4 November 2018. Material was copied from this source, which is available under a Creative Commons Attribution 4.0 International License. ^ "Condamine - town in Western Downs Region (entry 7875)". Queensland Place Names. Queensland Government. Retrieved 12 September 2017. ^ "Condamine - locality in Western Downs Region (entry 48291)". Queensland Place Names. Queensland Government. Retrieved 12 September 2017. ^ "Condamine, Queensland". AboutAustralia.com.au. Retrieved 15 September 2010. ^ a b c "Queensland Globe". State of Queensland. Retrieved 15 September 2017. ^ "Peat Lateral - Connecting coal seam gas to Queensland". Lucas Group. Retrieved 15 September 2010. ^ "Australian pipeline industry delivers on Braemar Pipeline". The Australian Pipeliner. Great Southern Press. April 2006. Retrieved 15 September 2010. ^ Calligeros, Marissa and Cameron Atfield (30 December 2010). "Second Queensland town evacuated due to floodwater". The Sydney Morning Herald. Fairfax. Retrieved 30 December 2010. ^ "Flood-weary residents abandon homes again". ABC News. ABC (Australia). 11 January 2011. Retrieved 12 January 2011. ^ "Annual Report 2016" (PDF). Condamine State School. Archived (PDF) from the original on 15 September 2017. Retrieved 15 September 2017. ^ "The oldest state primary schools in Queensland". education.qld.gov.au. Retrieved 2018-01-24.